Twenty-five seconds into the game? Williston Boys Hockey (10-7-1) had a 1-0 lead over the Loomis Chaffee Pelicans (9-7-2). Fifty-seven seconds into the game? 1-1. End of first period? 2-2. End of second period? 5-2. If you take out the second period of the game on Wednesday, January 29, 2014, Williston wins 4-2. However, New England Prep Hockey is a fifty-four minute game. After the game, Williston Head Coach Derek Cunha said to his team, “If you guys haven’t learned yet, you cannot take a shift off and win a game in this league. We gave them goals. In the second period, Loomis scored just 1:04 into the game. The goal was scored by junior forward Cory Swift, who recorded a Hat-Trick in the game. With just over seven minutes to go in the period, senior defenseman Seth Cupak was sent to the penalty for a five minute major, but was then dismissed from the game. During this five-minute major, the Pelicans added two more goals to their lead to take a 5-2 lead into the third period. The Wildcats responded in the final eighteen minutes, but two goals was not enough to send the game to overtime. Junior forward Brandon Borges scored a power play goal, his tenth goal of the season, 6:20 into the final period. The goal was assisted by senior forward Max Willman. With just under four minutes to play, junior forward Will Flynn scored to cut Loomis’ lead down to just one goal. During the final two minutes of the game, the Wildcats were forced to kill a penalty. They played very aggressively on this man disadvantage and were able to move the puck into the offensive zone, but were unable to capitalize. In the final eighteen minutes, Williston had ten minutes of power play including a few minutes of 5-on-3. One positive element of this game was that Williston sophomore goaltender Shane Mason played eighteen minutes of shutout hockey. Mason replaced senior Tim Nowacki after the second period. This was just the second time this season Nowacki has given up more than four goals in a game. Junior forward Tyler Scroggins scored both of the team’s goals in the first period. Scroggins has twelve goals, nineteen assists on the season. This was Williston’s last game before winter long weekend. The Wildcats will resume practice on Tuesday, February 4th. The team’s next opponent in NMH (15-6-1) on Wednesday, the 5th at home. 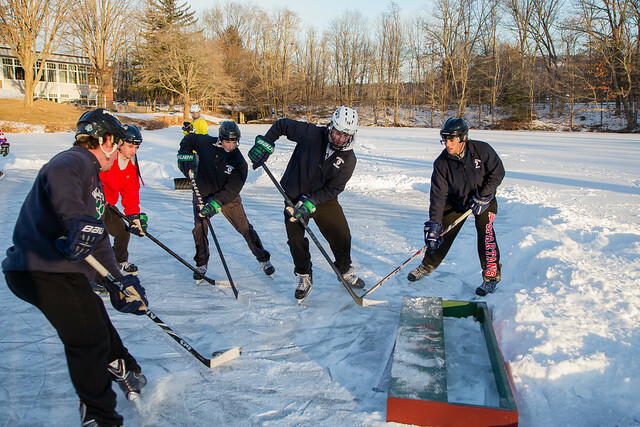 On Wednesday, January 28th, Williston Boys Hockey (10-6-1) will be looking for its third straight win when it takes on the Loomis-Chaffee Pelicans (8-7-2) in Windsor, Connecticut. This will be the first meeting between these two teams this season. The Wildcats are coming off a convincing 5-1 win over Westminster on Monday, the 27th in which Williston scored three goals in the first period. This was the first time since 1987 that Williston Boys Hockey has defeated a Westminster team. Loomis is 1-2-2 in it’s last five games and 3-3-2 since the holiday break. On January 18th, the Pelicans were defeated by Westminster 5-2. Loomis junior forward Ben Sharf (#17) leads the team in points (24), and junior forward Alex Esposito (#12) leads the team in goals (9). In its most recent New England Prep School Hockey Power Rankings, released on January 24th, the New England Hockey Journal ranked Williston at number fourteen. However, these rankings were created when the team had an 8-5-1 record. As usual, assuming there is phone service in Loomis’ rink, game updates will be available through the team’s Twitter (@WillistonHockey). A game report with reactions from players and coaches will be available after the game right here on In the Crease. Before the game, Williston Head Coach Derek Cunha said, “Excellent third period on Saturday, we use that momentum in the first period [of tonight’s game].” And that’s exactly what the Wildcats did. Williston Boys Hockey (10-6-2) used the momentum generated from a three-goal third period against Albany Academy on Saturday, the 25th to play arguably its best period so far this season. In the first eighteen minutes on Monday, January 27th, the Wildcats scored three goals against the Westminster Martlets (8-7-2) and put the game out of reach. This is the first time since 1987 that Williston Boys Varsity Hockey has defeated Westminster. This was the team’s second straight win and its fifth since the holiday break. Junior forward Tyler Sccroggins put Williston on the board just three minutes into the game when he got the puck down low near the goal and scored. Senior forward Max Willman and junior forward Will Flynn had assists on the play. This was Scroggins’ tenth goal of the season. Four minutes later, senior forward Kyle Hall got a breakaway after fighting past a Westminster defenseman and shot the puck past the goalie’s blocker on the left side of the net. Senior defenseman Seth Cupak and junior forward Jack Gethings had the assists on the play. With 4:17 to go in the first period, Williston took a commanding lead on a Willman goal. Junior forward Brandon Borges skated down the right side (facing the net) of the rink and passed the puck through a Martlet defenseman to Willman who deked the goalie and scored on his backhand. After the first period,the game settled down and just three total goals were scored in the final thirty-six minutes. Just over three minutes into the second, the Wildcats got their first power-play of the period. However, that power-play turned into a 4-on-4 when junior Borges went to the box for slashing fifty-one seconds into the power-play. This gave Westminster just over one minute of power-play in which the Martlets got scoring opportunities, but were denied by senior goaltender Tim Nowacki. Nowacki stopped twenty-seven of twenty-eight shots (.964%) in the game. Nowacki has the eighth best save percentage (.933) this season of all New England prep school hockey teams. Nowacki also has the eleventh most saves (406) of New England prep hockey goalies. With 4:09 remaining in the second period, the Wildcats left a Martlet standing alone in front of the net, so Westminster scored its first and only goal. As it has so often this season, Williston responded quickly after its opponent scored a goal. With 18.4 seconds remaining, junior Gethings got the puck on the right side (facing the net) of the ice in the offensive zone and netted the puck with a backhand shot. Cupak had the assist on the goal. At the end of the second period, the Wildcats had a 4-1 lead. Cunha reminded his team before the third period to do the little things well. Williston moved the puck well in the third and added one more goal with 13:57 to play. Willman got the puck down low on the right side of the net. He hesitated for a second before hitting the back of the net for his second goal of the game. This was Willman’s 18th goal and 33rd point of the season—both team highs. 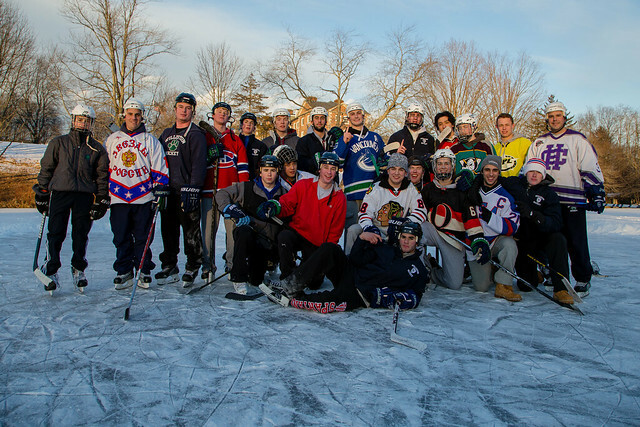 On Wednesday, January 29th, Williston will travel to Windsor, Connecticut to take on Loomis Chaffee (8-7-2). After Monday’s game, Coach Cunha reminded his team of how easy it is to have a letdown in the next game and how it cannot afford one in this part of the season. In a rare Monday night game, Williston Boys Hockey (9-6-1) will take on the Westminster Martlets (8-6-2) at 5 p.m. on January 27th. In their last game, the Wildcats defeated Albany Academy 6-2. Westminster had a rough start to its season, losing its first three games. But since early December, the Martlets have lost just three games. Since the holiday break, Westminster is 5-1-1. Sophomore forward Taggart Corriveau (#24) leads the team with thirteen goals and twenty points. The Wildcats are 2-2-1 at home this season. In its last two home games, though, Williston is 2-0 and have outscored its opponents 10-3. Game updates will be available via the team’s Twitter (@WillistonHockey). Also, a game report with reactions from players and coaches will be available after the game. In a game in which Williston (9-6-1) saw more scoring production from lines other than its top line, the Wildcats defeated the Albany Academy Cadets (6-9-3) 6-2 at home on Saturday, January 25th. Going into the second period, the score was tied at one. In the first, less than four minutes into the game, junior forward Brandon Borges skated into Williston’s offensive zone before passing the puck to senior Max Willman. Willman evaded one Cadet defenseman and then scored on a backhand shot. Junior forward Tyler Scroggins also had an assist on the play. Eight minutes later, on the power-play, Albany’s leading scoring, junior Shawn Knowlton, scored his fifteenth goal of the season. This tied the game at one. Less than two minutes into the second period, junior defenseman Chris Dumont scored his first goal of the season to give the Wildcats a 3-1 lead. Dumont was on the left (facing the goal) side of the rink, near the boards, when he got the puck. He took a slap shot that never left the ice and found its way into the back of the net. After the game, when asked if he meant to really shoot, or was just looking for someone to tip the puck in, Dumont said, “Well, I’d like to say [I did shoot it there], but the truth is that I was looking for a stick, I saw [Scroggins] in front there. I was trying to get [the puck] down low, hoped it go in, but I got the monkey off my back, my first [goal]. Under nine minutes later, the Wildcats took a 3-1 lead when Scroggins scored his ninth goal of the year. Senior defenseman Seth Cupak and Dumont had the assists on the goal. Although the Wildcats entered the final period with a two-goal lead, Head Coach Derek Cunha was not pleased with his team. He told them they needed to stop talking to their opponents after the whistle and that they need to play less individualistically. The Cadets made it a one-goal game just 1:18 into the final eighteen minutes when junior forward Knowlton scored his second goal of the game. However, the Wildcats responded by scoring three unanswered goals in the final 15:03. The first, scored by junior Will Flynn and assisted by senior forward Kyle Hall came just under two minutes after Albany’s goal. Five minutes later, senior Anthony Mantz gave Williston an authoritative 5-2 lead. This was Mantz’s second goal of the season. Junior forwards Brandon Bork and Rourke Ferguson had the assists on the play. With fifty-five seconds remaining, Williston sealed the deal with a shorthanded goal. Mantz picked up the puck and skated down the right (facing the goal) side of the ice. He then slid the puck to Ferguson who tapped the puck into the net for his fourth goal of the season. It was ironic that the Wildcats scored on the penalty kill considering that they had eight power-plays which amounted to 17:06 minutes—over thirty percent of the game–and never scored with the man advantage. Senior goaltender Tim Nowacki stopped 29 of 31 pucks (.935%). This was the first of a two-game home stand. Next, on Monday, the 27th, Williston will face Westminster (8-6-2). On Saturday, January 25 at 4 p.m., Williston Boys Hockey will be looking to redeem themselves against Albany Academy (6-8-3) after a 6-5 loss to Millbrook (13-8-1) on Wednesday, the 22nd. Since the holiday break, Williston has gone 3-3 with two one-goal losses. The Albany Cadets have won two games, lost three, and tied one. The Cadets, like Williston, have a large group of juniors on the team. Of the 28 players listed on Millbrook’s roster, twelve of them will be graduating in 2015. Junior forward Shawn Knowlton leads the team with thirteen goals and 25 assists. Most recently, the Cadets were defeated by Gunnery 7-0. On January 18th, against Gunnery, the Wildcats gave up three goals in the third period and were defeated 6-2. For the second straight game, Williston Boys Hockey gave up six goals in the game and were outscored in the final period. On Wednesday, January 22nd, the Wildcats began the third period with a 4-3 lead, but were eventually defeated by Millbrook (13-8-1) 6-5. Just under four minutes into the final eighteen minutes, Millbrook tied the game at 4-4. Less than two minutes later, junior defenseman Jo Labreque took a slap shot from the top of the left circle (facing the goal) and the puck found its way to the top right corner of the goal. This gave Williston a 5-4 lead. With 6:21 to play, the Mustangs tied the game at 5. Then, with 3:28 to play in the game, Millbrook took a 6-5 lead. The Wildcats did have control of the puck in the final 2:32, but were unable to capitalize, and eventually the buzzer the sounded. Williston first got on the board when junior forward Rourke Ferguson gave Williston a 1-0 lead with just over eight minutes to play in the first period. The goal was assisted by junior defenseman Chris Dumont and junior forward Brandon Borges. But two minutes later, the Mustangs tied the game at 1-1. Borges gave the Wildcats the lead three minutes into the second period. Senior forward Max Willman had the assist on the play. Then, three minutes later, on the power-play, Millbrook tied the game. The Mustangs then took a 3-2 lead two minutes later. The Wildcats responded with two goals within a two minute span. The first was scored by junior forward Will Flynn and assisted by senior defenseman Seth Cupak and junior defenseman Chris Dumont came 11:51 into the period. The second, exactly two minutes later, was scored by Scroggins and assisted by Willman and Ferguson. This goal gave the Wildcats a 4-3 advantage. This is just the second time this season Williston has lost two consecutive games. Junior forward Brandon Bork exited the game after just one shift due to a broken skate blade. On Saturday, January 25th, Williston will be looking to redeem itself when it takes on Albany Academy (6-8-3) at home. On Wednesday, January 22nd, Williston Boys Hockey (8-5-1) will travel to Millbrook, N.Y. to take on the Millbrook Mustangs (12-8-1). Since the holiday break, Williston has a record of 3-2. The three wins came against Worcester Academy (1/8/14), Winchendon (1/10), and Vermont Academy (1/15). In those three games, the Wildcats outscored their opponents 16-4. The two losses were against Berkshire (1/12) and Gunnery (1/18). In those two losses, Williston was outscored 8-3. Millbrook is 3-4 since the holiday break and most recently lost to Canterbury 2-4, who Williston defeated 4-2 in the season opener back on November 23rd. On January 15th, Millbrook was defeated by Gunnery 5-2. Mustang senior forward Brett Supinski (#19) leads the team with 14 goals and 16 assists. Supinksi has committed to Union (D1, ECAC) for college hockey. Millbrook is a is very experienced team with ten seniors on the roster- five defenseman, five forwards. Coach Cunha has told me that he does not believe there will service for phones at Millbrook. Because of this, game updates, most likely, will not be available during the game via the team’s Twitter (@WillistonHockey). The hockey team has been having some success in the first bit of the year. The best way to describe it is that coming from the locker room, the boys are buzzing. We just mean we are always ready to go. We’re are a team that is excited to get out on the ice against any opponent and show them what we got. We’ve had a couple of tough losses but we’ve learned how to grow from them. Those loses made us hungrier. We will not be content with our season until the playoffs roll around and we are in them. It’s a goal we’re all looking for and once we’re there, we’ll take it one game at a time expecting a win. Going into the third period on Saturday, January 18th, Williston Boys Hockey (8-5-1) was trailing Gunnery (12-5-0) 3-2 on the road. Less than five minutes into the third, the Wildcats were down 5-2 in a game that seemed like a lost cause. Gunnery took a 4-2 lead 3:08 into the third period with both teams having a player in the penalty box. An official signaled for another penalty, but Gunnery still scored on a slap shot from the top of the right faceoff circle (facing the goal). Junior forward Jack Gethings still went to the penalty. This gave Gunnery a 4-on-3 man advantage, but it could not capitalize on the situation. Just two minutes later, Gunnery added to its lead to go up by three goals. Then, with just under five minutes to go in the period, Gunnery took a decisive 6-2 lead when it scored on an odd man rush and Gunnery forward Nathan Sucese took a wrist shot to score. This goal completed the Hat-Trick for Sucese, which now gives him nine goals on the season—second most on the team. In addition, Sucese has a team-leading 25 points. Williston killed five of six penalties in the game, but was unable to capitalize on its four power plays. Although it probably would not have made a huge difference in the game, there seemed to be some “home-town officiating.” The game did begin to get more physical in the second and third periods, but there were not as many after-the-whistle altercations as have occurred in recent games. With this loss, Williston dropped to 7-3 in games away from home and is now just three games above .500. Six minutes into the game, Gunnery took a 1-0 lead on a goal scored by Sucese. Two minutes into the second, on the power play, Gunnery took a 2-0 lead. Williston responded just twelve seconds later when junior forward Tyler Scroggins scored his seventh goal of the season. Senior forward Max Willman had the assist on the play. With 12:02 remaining in the second period. Gunnery took a two-goal lead on Sucese’s second goal of the game. Once again, Williston responded to Gunnery’s goal just eighteen seconds later. Junior forward Brandon Borges passed the puck from the left side of the goal to Co-Team Captain Willman on the left (facing the goal) who netted his fifteenth goal of the season. This was also Borges’ team-leading seventeenth assist of the season. And that’s precisely what Gunnery did in this game. Although the line scored two goals, it was not enough when the team allowed six goals. For the fifth straight game, Williston was without Co-Team Captain and senior defenseman Nick Staub (groin injury). On Wednesday, January 22nd, the Wildcats will take on Millbrook (12-7-1) on the road.